At 55 years old, this adventurous Chilean wine is the oldest brand of Viña San Pedro. 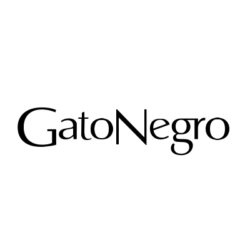 Every two seconds three GatoNegro bottles are opened somewhere in the world. Sold in over 80 countries, this cat is truly Adored Everywhere. The black cat started out as our friendly companion. It charmed our winemaker until he was convinced its very presence inspired amazing wines. And so the black cat became a symbol, a sign of good luck. To spread its fortune with everyone, we put it on all our wines and sent them out to the world. And then the cat became a globetrotter, as lively as ever, filling glasses everywhere with vibrant varieties. 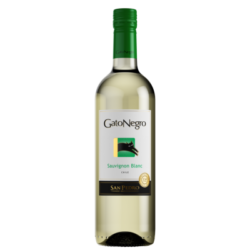 Now, many lifetimes and milestones later, this black cat, and this fantastic wine, have arrived here to cross your path. Pale yellow color with hints of green notes. Fresh tropical fruit mouth sensation. Basically, summer in a bottle! Central Valley, mainly from our La Huerta Vineyard: a cold zone with Andean influence, perfect for developing tropical aromas. 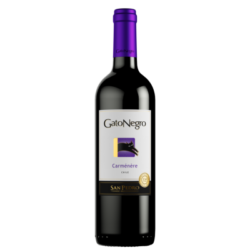 Flavor of ripe fruit and fresh aromas of blackberries and blackcurrants mixed with spicy notes and hints of vanilla and tobacco. This wine has quite the personality! This wine comes from our vineyards in Molina, in the seventh region in the country (Central Valley).